Chris Woolfenden enjoys a Lyons coffee. Two famous foodservice brands have been reunited as Wimpy UK introduces Lyons Coffee to its latest menu of its franchised casual dining restaurants. The partnership will see the coffee brand owned by UCC Coffee UK & Ireland, named as the exclusive coffee supplier to Wimpy’s nationwide chain. 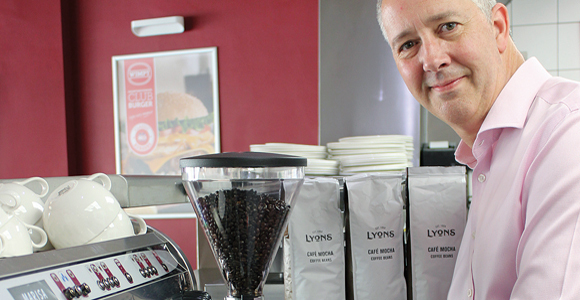 Chris Woolfenden, managing director of Wimpy UK says this marks a new beginning, as he explains: “We are absolutely thrilled that Lyons is part of the Wimpy family. Lyons Coffee has seen it all, it’s been on the British scene for more than 100 years and together we share the same values of great taste, no fuss and excellent value. The shared history of the two brands began when the originally named ‘Wimpy Bar’ was launched as a specialist fast-food section within Lyons’ traditional Corner House Tea Room. Wimpy’s popularity soon led it to establish separate restaurants serving only hamburger-based meals, which Lyons helped to develop. In 1977, United Biscuits acquired Wimpy and 30 years later it was bought by a South African-based food service franchisor, Famous Brands Group. In 1978 Lyons was sold to Allied Breweries and later acquired by UCC Coffee UK & Ireland. Wimpy currently has 78 restaurants across the UK and is currently rolling out a refurbishment programme across the network.